Product prices and availability are accurate as of 2019-04-11 17:46:10 EDT and are subject to change. Any price and availability information displayed on http://www.amazon.com/ at the time of purchase will apply to the purchase of this product. This Feit Electric tunable White, color changing, A19 smart LED light bulb works with apple home kit (apple’s framework for home automation). the concept of a smart home easily obtainable and customizing your light is effortless. Easily turn lights on/off, dim, set Groups and schedules with your smart phone or control lighting by asking Siri. Tailor the light to suit your mood, the tunable White feature lets you adjust light color temperature from relaxing 2700K soft White to energizing 6500K daylight. or you can increase the fun and celebrate by choosing light colors it’s up to you. Set up is simple with no special smart home hub required. The bulb connects directly to your device using Bluetooth and the apple home app that comes preloaded on your apple smart device. For away from home access, home hub set up is required. Set up your apple TV, iPad, or home pod as a home hub to enjoy scheduling and automating your lights from anywhere. Designed to fit standard light sockets, the versatile E26 medium base light bulbs makes it an easy and cost-effective way to introduce smart lighting in your ceiling fixtures, table, floor lamps and more. This reliable A19 shaped bulb is rohs Compliant, 100% mercury free and will shine for a decade or more without needing to be replaced. Now you can enjoy all the advantages of energy saving LED with the added convenience of smart home technology. Feit is a leader in first to market lighting innovations and driven to deliver the latest breakthrough in interior and exterior illumination. To us, lighting is everything. The right light can turn a house into a Home, make an unsafe area feel more secure, and navigating your way back to bed a lot easier. Our LED product portfolio includes a full line of energy efficient LED bulbs and retrofit kits. Feit Electric also manufactures energy-efficient LED luminaire including ultra-slim edge-lit ceiling fixtures, light-weight utility shop lights, and weatherproof outdoor LED fixtures. Family owned. Family operated. Based in Los Angeles, California since 1978. See more of our Feit family of products and use your Amazon gift card. 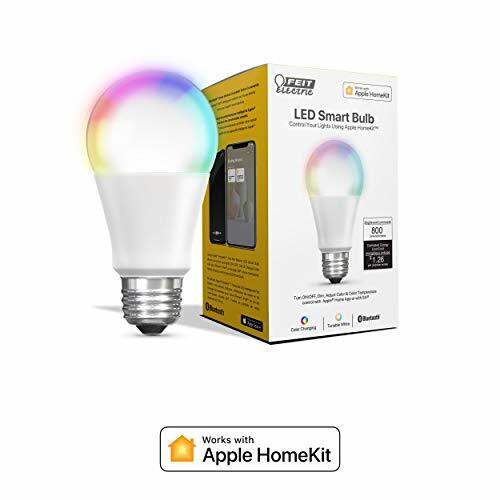 EASY to CONNECT & USE - Upgrade to Smart light bulbs that work with Apple HomeKit on your iPhone, iPad or iPod Touch (devices sold separately). Connects using Bluetooth to control bulbs with your Apple smart devices or ask Siri to dim your lights, turn on or off, change color and more. There's no need for special smart home hubs. FEATURES - Bulbs work with Apple HomeKit for home automation and voice commands (compatible with iOS 10.0.1 or later). Using a HomePod, iPad, or Apple TV as your Home Hub, you can take control of your lighting experience from anywhere using your iPhone or iPad to create schedules and automations that fit into your daily routine. The bulb replaces a 60W equivalent incandescent and produces 800 lumens using only 10.5W. This A19 classic shaped bulb with an E26 base is long lasting. COLOR CHANGING - This LED light bulb offers tunable white which adjusts light color temperature from 2700K through 6500K or choose a colors. Choose a bright daylight or calm soft white light or from over a million colors, it's all up to you. SMART LED TECHNOLOGY - Feit Electric LED lights, providing the most energy efficient and highest quality light with smart Apple connectivity, are perfect for your modern, connected home. LED lighting uses less power, rated to provide up to 15,000 hours of reliable light, and can be controlled via your iOS device when you're away from home (Home Hub set up required). INNOVATOR IN ENERGY EFFICIENT LIGHTING - Founded and headquartered in California, Feit Electric is celebrating 40 years as a leading global lighting manufacturer. From outdoor string lights to night lights, Feit Electric offers its customers a full portfolio of reliable lighting products including home décor lighting collections, light fixtures, smart and feature rich high-performance lighting solutions as well as a full line of general household, specialty light bulbs in all shapes, sizes and configurations.